This time out we'll be looking at the Wardroids from Pig Iron Productions, specifically the regular Wardroid (WD.1), Wardroid Walking (WD.2) and the Wardroid Upgrade Pack (WD.3). 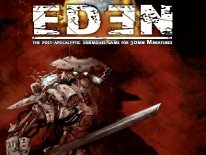 These are heavily armored, and are larger than an average 28mm scale human wearing clothes or power-armor (roughly 40mm tall). Think of these as Pig Iron Productions answer to Games Workshop's Terminator heavy armor clad pieces. These are also all metal pieces, and they do contain lead. The packaging states this clearly. First up is the Wardroid (WD.1). This model comes as 7 separate pieces. The body minus arms and head is the largest piece, the remaining 6 pieces come on a metal sprue. 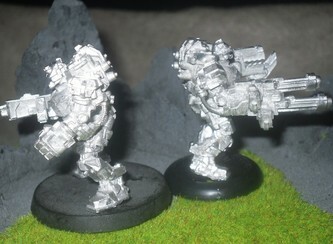 On the sprue you'll find two arms, two weapons which fit at the wrist, a separate fist, and a single head. 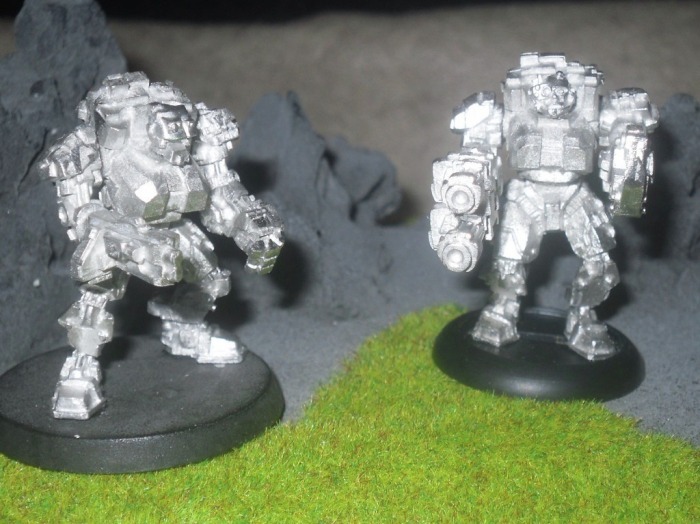 One of the two weapons resemble a heavy bolter/machine-gun-like weapon, the other is fairly generic in presentation, so it could be a lascannon, meltagun, or pretty much what ever you want to call it. By design, these are both right-handed weapons, so you'll need to choose which one you want to use. You could I suppose glue the other one onto the left arm, but it might look funny, since it's clear that arm is meant to have the fist. Visually, it's a nice looking piece. 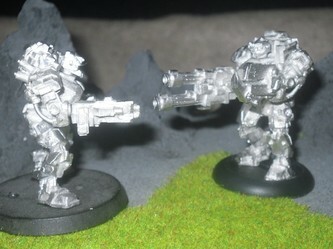 It has a more block-like, or boxy style armor, versus the smooth and contoured Terminator armor GW utilizes. I like this look a lot, its different. I'm just not that fond of the the head provided. It doesn't impress me as much as the rest of the piece. Although this is a droid, and it's not supposed to be a man inside the armor. In all fairness the head does look like the head of a droid, versus a helmeted man. The pose of the piece is quite standard, legs spread, knees bent a little, standing there ready for action. Clean up and assembly didn't pose any major problems. There are some mold lines, and a few were a bit tough to get to along the legs. 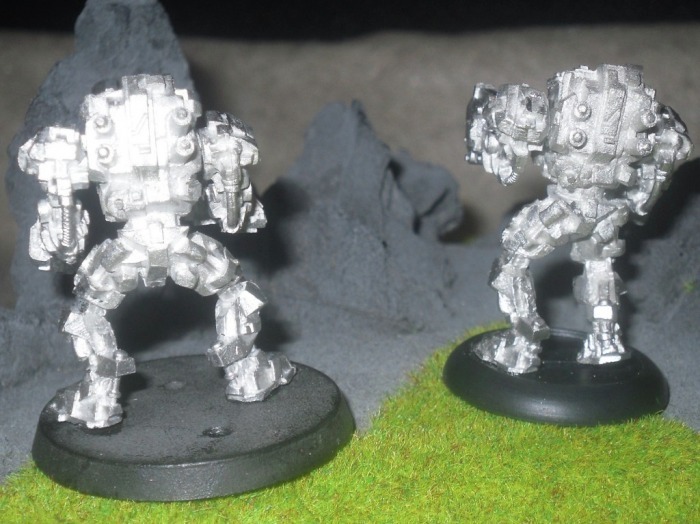 There are also two pegs on the bottom of each foot, which are the same size as those you'd expect find on the feet of a GW Terminator, or other pieces that fit on a standard 40mm round base. The arms are also made so that the arm sockets, fit on to the posts on the upper body. I like the fact that I don't need to pin these, due to this design. However, the peg and sockets aren't exactly a tight fit, so while I didn't have to pin them, it's an option that some might need to pursue. The weapons and wrist of the arms utilize a tongue and groove design, and fit together even better than the arm/torso bits. The head simply sets on a flat spot with a small lip around it, and that pretty much covers assembly. This isn't at all a complicated model to build. Like all Pig Iron Productions pieces, this one doesn't come with a base either. Overall this is a very nice sculpt, with loads of little details. Direct from Pig Iron Productions this piece cost 7 GBP, converted equals $10.60 USD, and I've seen them selling for roughly $12 online here in the US. 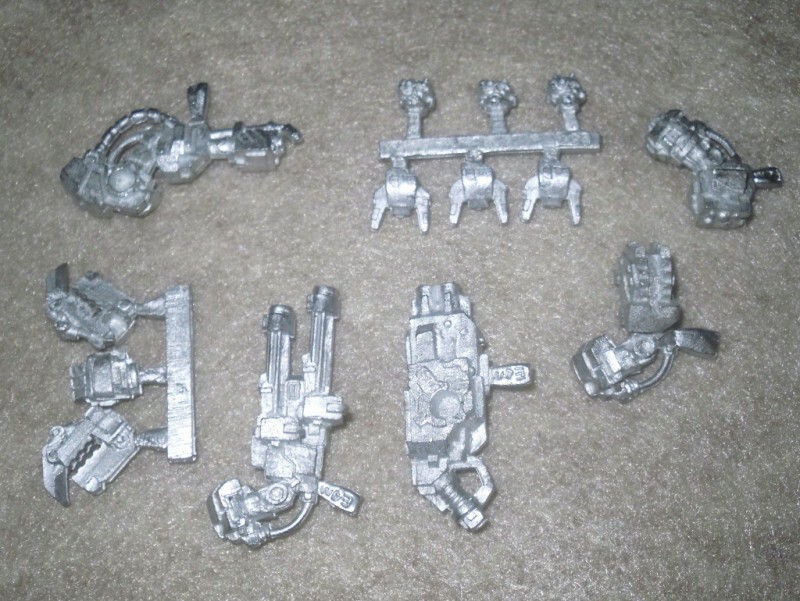 The Wardroid Walking (WD.2) is also 7 pieces, and comes with the same exact accessory sprue, with the two arms, two weapons, fist and head on a metal sprue. The only thing different with this model is the body minus the arms and head. This one has the same armor and armor details as the other one, only the legs are positioned in a walking stance. There are also two different variants of this model, and which one you end up with is determined at random. The one I ended up with looks like the one that's standing tall and taking small steps, versus the other one which has more of a crouched look, taking larger steps. Also like the non Walking model, this one wasn't too bad on clean up and assembly either. It too had some mold lines to clean up, but nothing unexpected or overly time consuming to remove. It will also require a base, and it features the same peg/socket arm design, and tongue and groove weapon/wrist design, so assembly is a cakewalk. I only had a single 40mm base to work with when putting this review together, which is why this piece in the photos is using a 30mm round lipped base instead. Due to how close together the feet are positioned, a single 30mm base actually works quite well. This model also shares the same pricetag of 7 GBP or $10.60 USD. Last but certainly not least is the Wardroid Upgrade Pack (WD.3). 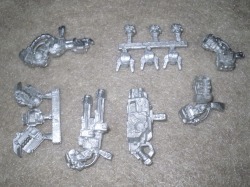 This kit comes with a variety of heavy weapon arms, 2x head variations (with 3 of each type), 2x close combat claws (right and left), a meat tenderizer/grinder looking arm, an arm with a small missile launcher built in, and a right-handed fist, to accommodate the left-handed fist that the Wardoids WD.1 and WD.2 come with standard. The large heavy weapon arms appear to be a heavy flamer, an autocannon with dual mini-gun barrels and ammo boxes, and what looks like a large melta/plasma/lascannon device. Of the 6 heads provided, 3 of these are humanoid heads with what look to be cybernetic implants. The other three heads have a horned, or bug-like look about them, with dual horned things sticking outwardly forward from each side of the head. Sadly the six heads aren't all unique, as there's only two different heads, but with 3x of each type on the sprue. Lastly the pincher claws are also bladed on the ends, so they look quite menacing. As for clean up and assembly, a few pieces did have mold lines, but nothing that a few minutes with a file and hobby knife couldn't remedy. Quite a few also came with mold tabs intact too. All of the pieces utilized the same peg/socket and tongue and groove design of the other parts that come with the Wardroids standard. So mixing and matching the parts with the existing Wardroids is quite simple. This pack carries the same price-tag as the other two Wardroids at 7 GBP, which equals $10.60 USD. I do think that if they bumped the cost up by $2 USD per figure, and included the human/cyborg head, and an optional arm or two with the existing products, and did away with the Upgrade Pack, that it would add more value to those existing models. This way you wouldn't need an Upgrade Pack. Either way, the optional pieces are really nice, and the Upgrade Pack is a nice way to beef up the existing models. If given a choice between the two, I usually prefer metal over plastic. Maybe it's because I'm older, and I have been around the hobby long enough to remember when we had no plastic pieces. That's not to say I don't appreciate plastic. In some cases plastic is simply a lot easier to work with. For example, the metal sprues that the accessories come on for the Wardroids, some of these will require some good cutters. You can't simply whack these off the sprue with your hobby-knife as easily as you can plastic bits. Granted, some pieces will twist off without incident, but a few of them required snips. There's also the fact that due to the all metal design, utilizing rare-Earth magnets is far more work than what's it's worth to attempt using them to mod these models. If these were plastic, I could swap the arms out, and have more options via rare-Earth magnets. On the plus side, the Upgrade Pack includes some human heads, so these could be cyborgs, or guys in a big suit of armor. Although it would be even nicer if they included that option with WD.1 or WD.2 to begin with. The Upgrade Pack does consist of more metal than the figure packs alone too. There's enough bits in the Upgrade Pack to beef up around 6 models overall. For $10.60 USD, that's a pretty good deal. 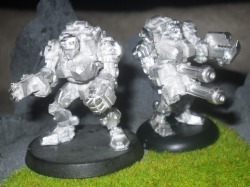 Cost-wise Wardroids are competitively priced with other all similar sized metal models out there, they make for very nice stand-in Terminator armor types in 40k, and could serve a variety of roles in other popular sci-fi wargames just the same. Additionally, if you were to buy any single blister packed GW model, which utilized this much metal, I guarantee you wouldn't walk out of the store with it for any less than a $20 bill.